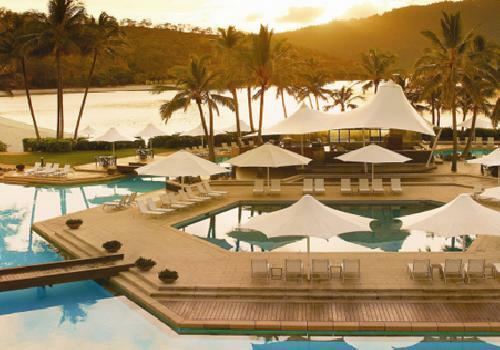 The Hayman Island Resort has been rated as one of the best hotels in not only Australia but even the world as it provides you with a truly remarkable island experience that incorporates lreaxing seclusion and natural beauty. The property has a wide selection of luxuriously appointed hotel rooms and suites that have been specifically designed to make the most of the lovely resort and island surrounds. The comfort and enjoyment of guests is the main priority for the friendly staff at the Hayman Island Resort, so you can be assured of a memorable holiday experience in tranquil tropical surroundings. At the Hayman Island Resort there is a wonderful array of resort activities available to provide you with relaxation, rejuvenation, indulgence or adventure. There are leisure activities ranging from water sports and island tours right through to specialty classes and great shopping within the resort. A wide range of dining options awaits you at the Hayman Island Resort including contemporary Australian, exotic Asian, Italian and even light snacks at the pool bar. Guests can also enjoy the famous salt water Hayman pool or the heated fresh water Lagoon pool. There is also an acclaimed health spa with 13 treatment rooms providing holiday makers with an array of treatments and wellness programs that can be personally tailored to your needs. There are plenty of wonderful tourist attactions and exciting activities located close by to the Hayman Island Resort. These include day trips to the Great Barrier Reef where you can marvel at the vast array of coral formations and marine life, Whitehaven Beach where you can frolick along the 7kms of pristine beach and sailing adventures around the numerous uninhabited islands of the Whitsundays. Back at the Hayman Island Resort you can go swimming in 3 salt and fresh water swimming pools, experience catamaran sailing, fishing, whale watching, play squash and various other fitness activities.